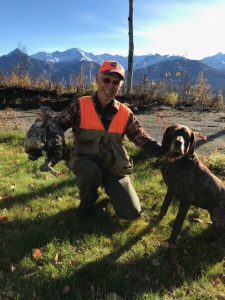 Bud Rice with one of his dogs and a grouse. In Alaska, dogs can be team members with mushers and also with hunters, using their abilities to extend our own. But first, someone has to let the animals know how to do those jobs. Judging by the dogs we’ve seen around Anchorage, many of us are not very good at training– but our guests on the next show are. They work with upland hunting dogs and sled dogs to create an effective dog/human team. Join us for that and more on the next Outdoor Explorer. Segment 1: “Training hunting dogs”. Gretchen Clark and Bud Rice of the Arctic Bird Dog Association. Segment 2: “Training sled dogs”. Kourosh Partow, sled dog musher and member of the Chugiak Dog Mushers Association.